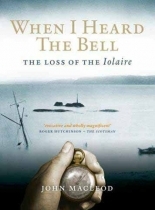 When I Heard the Bell tells the story of the tragic loss of HMYIolaire, a grossly overloaded boat sent to bring hundreds of Royal Naval Reservists home to the Isle of Lewis on 31 December 1918. Within sight of the pier at Stornoway and the mens families, the boat struck rocks and sank. Over two hundred men who had survived the horrors of World War I drowned. The tragedy remains the worst peacetime British disaster at sea since the sinking of the Titanic and even today on Lewis and Harris, it is a painful subject rarely spoken of.